Three hundred and eighty six students received special scholarships at the recent Sunway College Special Scholarship 2016 Award Ceremony, celebrating some of the best and brightest youths from all over the country. The Special Scholarships, amounting to about RM 3.5million will enable the students to pursue studies in the Cambridge GCE A Level, Australian Matriculation Programme (AUSMAT), Canadian International Matriculation Programme (CIMP), Monash University Foundation Year (MUFY), Sunway Foundation in Arts (FIA), Foundation in Science and Technology (FIST), Certified Accounting Technician (CAT) and Certificate in Finance, Accounting and Business (CFAB) at Sunway College. A total of 386 students received the Special Scholarship Awards. 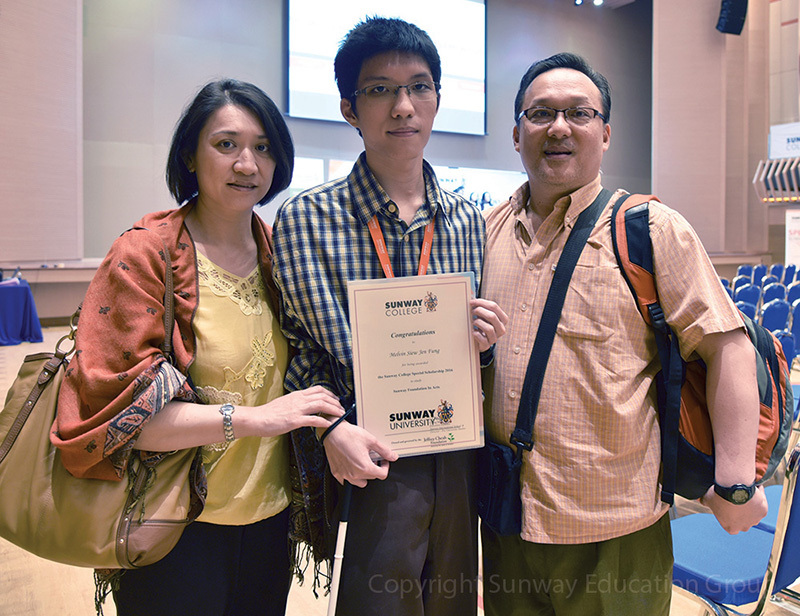 Melvin and family – Melvin (centre) with his parents, Poh Li and Eric Siew. 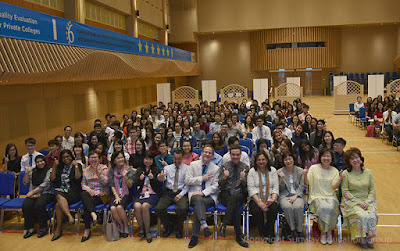 She also encouraged the students to fully engage in the Sunway community, take advantage of the opportunities available and at the same time, give back to the community through volunteering their time and fully engage as members of the Sunway academic community, as these will open doors to many other opportunities. Among the recipients was Melvin Siew Jen Fung who just started his studies in the FIA programme. The 18 year old who was diagnosed with visual impairment shared that he is not worried about his studies at Sunway College as he has found friends, classmates and lecturers very helpful. The former student from SMK Sri Hartamas also commented that the FIA offers a broad range of subjects. He plans to pursue further studies in Computer Science after finishing the Foundation programme. Sunway College is part of the Sunway Education Group, owned and governed by the Jeffrey Cheah Foundation, a not-for-profit entity dedicated to providing educational opportunities for deserving students. To date, the Foundation has awarded quality education through scholarships amounting to more than RM210 million to thousands of deserving students. The six Pre-University programmes at Sunway College, the Cambridge GCE A Level, Australian Matriculation Programme (AUSMAT), Canadian International Matriculation Programme (CIMP), Monash University Foundation Year (MUFY), Sunway Foundation in Arts (FIA) and Foundation in Science and Technology (FIST), focuses on delivering university preparatory programmes to equip students with critical thinking and independent learning skills, preparing them for admissions into premier universities all over the world. Dedicated and approachable academic teams nurture and mentor students to develop and expand these skills and capabilities, and students often exceed expectation in their academic performance. The Certified Accounting Technician (CAT) is a stepping stone towards the Association of Chartered Certified Accountants (ACCA) while Certificate in Finance, Accounting and Business (CFAB) is a stand-along business qualification that provides essential knowledge in the fundamentals of finance, accounting and business. The programmes at Sunway also have strong emphasis on extra-curricular activities, students are encouraged to join clubs, societies, participate in sports and community service with as much enthusiasm as their studies. Through this, they learn team spirit and leadership qualities, build confidence, communication skills and friendship that will benefit them in their future undertakings.